Vepampoo - in tamil (english:Neem flower, botanical name: Azadiracta indica) is a very medicinal flower of the Neem tree. The benefits of Neem are innumerable and has been recognized in India for thousands of years. Every part of the Neem tree has medicinal property. Neem tree's bark, leaves, flowers, fruit, root, twig, gum, oil and seeds are used in many different ways. For ages, neem has been used as an Ayurvedic medicine. "Various parts of the neem tree have been used as traditional Ayurvedic medicine in India. Neem oil and the bark and leaf extracts have been therapeutically used as folk medicine to control leprosy, intestinal helminthiasis, respiratory disorders, constipation and also as a general health promoter. Its use for the treatment of rheumatism, chronic syphilitic sores and indolent ulcer has also been evident. Neem oil finds use to control various skin infections. Bark, leaf, root, flower and fruit together cure blood morbidity, biliary afflictions, itching, skin ulcers, burning sensations and pthysis says D.P. Agrawal. Also, biologically neem is used as Anti-inflammatory; Antiarthritic; Antipyretic; Hypoglycaemic; Antigastric ulcer; Spermicidal; Antifungal; Antibacterial; Diuretic; Antimalarial; Antitumour; Immunomodulatory etc." I got neem flowers (vepampoo) when I visited India last year. Thanks to my sister's MIL Smt. Jayalakshmi Ramachandran, for collecting these flowers fresh from the ground, patiently discarding the dirt and sharing it with us. The dried neem flowers have shelf life for few years. In this recipe, I have used vepampoo in preparing a healthy dish called 'vepampoo saadam' or 'neem flower rice' by roasting the neem flowers and mixing it with cooked white rice. The recipe is very simple and is my mom's recipe. Here is how it is prepared. Heat oil in a kadai keeping in low heat. When it pops, add the red chillis, urud dal and neem flower. (do not wait for the urud dal to turn brown as it will become brown when the neem flower is roasted). Roast the neem flower stirring continuously. The neem flowers will get darker. Roast until the urud dal becomes dark brown. Remember to keep in low heat. Add the asafoetida powder and stir well and turn off heat. 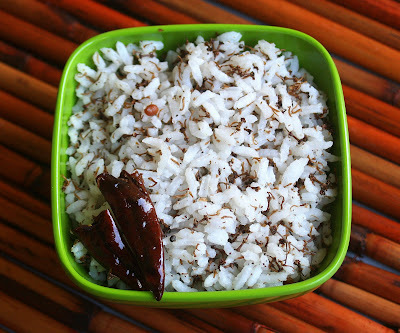 To one cup of cooked white rice, add a teaspoon of this roasted neem flower. Mix well adding a dab of ghee and salt to taste. Just one cup is enough for one person. Try to have this atleast once a week. This will clense our system. Important: Make sure to chew the rice hard before swallowing. The neem flower can be used to prepare rasam and kuzhambu too. This is my entry to JFI - Flower power hosted by Rachna of Soul food. JFI is Jihva for Ingredients started by Indira of Mahanandi. This picture (saffron bowl with roasted neem flower, white plate with dry neem flower and green bowl with neem flower rice) is my entry to Saffron white green event hosted by Pooja of Creative pooja in connection with the Indian Independence day on Aug 15th. Thank you Rachna and Pooja for hosting these wonderful events. Wonderul recipe. Inever heard of this. looks much tempting :). Thank your for yourniceentry dear Mythreyee.As my cpu got crashed it took me some time to come and check this . It's like edible flowers. Good idea.